This mechanical sonar scope helps isolate engine problems, allowing you to hear inside the engine. You can monitor all parts of the engine, bearings, motors, chassis, gearbox and so on. It is suitable for cars, ships, aircraft, machine tools and other mechanical equipment. - Material: rubber, plastic, stainless steel. - Long Needle: 250 mm. - Short Needle: 80 mm. 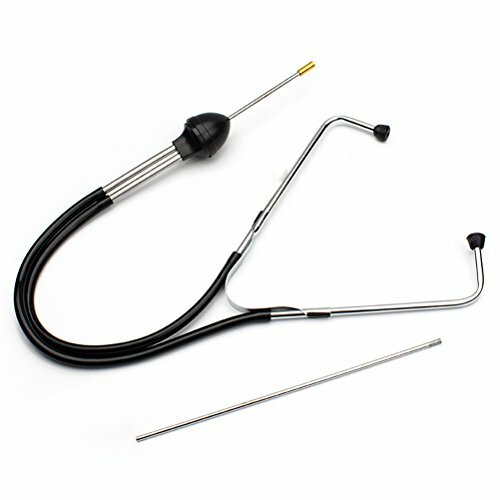 - This mechanical sonar scope helps isolate engine problems, allowing you to hear inside the engine. - Quality Chrome-plated steel construction with Soft PVC hose and probe. - Diagnostic piston slap sound, sound gear wear. - Navigate to the dashboard from the engine banging and screaming. - For all parts of the car, you can quickly monitor abnormal sound of the site. - Suitable for maintenance technicians, mechanics, vehicle maintenance staff, security monitors, such as the use of personal vehicle owners. Material: rubber, plastic, stainless steel.